Toto have announced that they’ll release a new live package next month. It’s titled 40 Tours Around The Sun and will arrive on DVD, Blu-ray, DVD/2CD, Blu-ray/2CD, 3LP, 2CD and on digital and streaming platforms on March 22 via Eagle Rock. The performance was captured in front of 18,000 Toto fans at Amsterdam’s Ziggo Dome in March 2018 as the band toured in celebration of their 40th anniversary. Along with the live set from the night, the DVD and Blu-ray packages will feature new interviews with Steve Lukather, David Paich, Steve Porcaro and Joseph Williams. 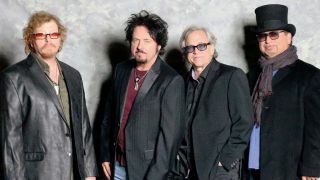 A statement on 40 Tours Around The Sun reads: “Toto remain one of the top-selling touring and recording acts in the world. They are the benchmark by which many artists base their sound and production, and they continue to transcend the standards set by the entire music community, being simply synonymous with musical credibility. Find a trailer for the release along with further details below. Toto will return to the road later this month for shows in Japan. They'll then head out for further dates later this year, including a headline set at London’s Live At Chelsea.